Not long ago, my oldest son asked me to send him one of his favorite books (now in college, he has always been a lover of books and treats his collection like a group of dear old and valued friends). The book he requested? Frederick by Leo Lionni (one of my absolute favorites!). He had rediscovered it, just like a long lost friend, and was experiencing it from a whole new vantage point, with its meaning resonating that much more deeply. That’s sort of the beauty of books, as with everything-change/evolve/tweak/adjust your aperture-perspective just a little bit and voila, just like magic, you have a whole new understanding and appreciation of seemingly the same old thing. 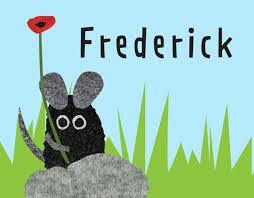 The book tells the story of Frederick the Field Mouse. We meet Frederick just as his other mouse friends are preparing for the long cold winter. These mice are furiously collecting supplies-nuts, grains, fruits-any kind of sustenance that will help them survive the long cold winter under the stone fence. As they frantically run around gathering their goods, they notice that Frederick is staring off into the sky, annoyingly not pulling his weight. When they angrily confront him, asking what in the world he is doing, he calmly replies that he is gathering colors, words and thoughts. Disgusted, the other field mice shrug, roll their eyes and return to the task of collecting and storing their food supplies. As the cold sweeps in and the mice are hunkered under the stone fence, they rapidly eat through all of their supplies. Now, they settle into the reality that they have nothing more to get them through the rest of the long, cold winter. Suddenly, one of the field mice looks over to Frederick, and sarcastically asks, “what about your supplies Frederick?” And at that moment, Frederick stands tall and begins to recite those words, describe those colors and thoughts that he had collected to tell stories of warm sunshine, green grass covered fields and bright blue skies. As Frederick shared his supplies to weave his stories, the mice felt the warmth. They were literally transformed. Now filled with gratitude, they could not stop thanking Frederick for his gathered supplies. For It was those words/thoughts/colors that lifted their spirits, shifted their energy and fed them with hope. And just like Frederick, I have spent this last bunch of months gathering my new supplies- collecting words, quotes, ideas and stories from books, lectures, webinars, conferences and workshops. They are my sustenance that help fuel my growth. And now it’s my turn to share some of these with you- to help lift your spirits, shift your energy and give you inspiration and hope. Enjoy!